Great pair of 1960s British jeans, made by Zeiko and compete with tags. They are unworn and in great unused shape, however the zip has broken and will need replacing. Well worth the replacement as these have a great tapered shape to them and pop stud to the top of the fly. Waist size 30, inside leg 30 plus 2 inch turn up. Postage is an estimate based on size and weight, refunds will be be given if it works out cheaper. Items sold as seen, please read description and view images as they form part of the description.Please see other items of vintage and militaria. INSEAM - 28". No exceptions. WAIST ACROSS: 15". Cotton denim material. Lee black tab on right back pocket. Made in United States by Lee. EXCELLENT: Previously worn with only very slight wash wear, possible tiny visible flaws. Types of flaws can include small scratches or pulls, slight or faint discolorations/fade/tiny spots or stains. Distress Paint Wear- see pics. Original Mid Century Western Cowboy Work pants dungarees. Outstanding pair of rare vintage Levi's 501 jeans! My mom bought them new in the 60s (circa 1969), wore them a time or two, and they've been in a box in the closet of the same house ever since. Great condition! This pair of Dungarees features a Scovill brass leaf design snap closure and a brass Scovill zipper. The Jeans are heavily creased from prolonged folding. This is a super nice pair of very early Jeans that are in near mint condition. The denim looks and feels great- no tears or holes; a nice indigo blue. I just wish I knew who made them. Snap button at waist. There is a little bleached area near the front fly area. We do not launder or alter them in any way, they are sold in their original condition. I believe these are 1960s era. There is general surface wear - they will NOT be in the condition of a new pair of jeans. Therefore, many of them will show light signs of wear. Doing that is against U.S. and international laws. Appear unworn. Snap button is corroded. Still works. No holes, tears, or stains. 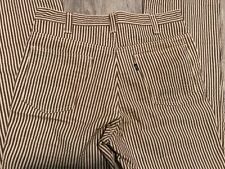 Up for sale is a pre-owned pair of 1960 Levi’s brown/white striped gentleman’s dress pants 34/30. Flared hem and in great condition. However, we are not perfect and can make mistakes. We typical respond within 12 hours. Darkest INDIGO. softer than denim but still very similar! Heavy feel. Barely used, looks like! On the sturdier side, not lightweight. These are zipper fly. Therefore, many of them will show light signs of wear. Fabric is crisp and (mostly) clean, still stiff. Waist: 16" straight across the top, laid flat. NIVER WESTERN WEAR. WESTERN PANTS. OLD SCHOOL PANTS. SOLID PANTS. DON'T LET THESE GREAT PANTS GET BY YOU! PAINT SPOT LEFT KNEE. PAINT SPOT LOWER RIGHT LEG. These are our standard rates. SELVEDGE LEG SEAMS. GRIPPER ZIPPER. REALLY GREAT CLASSIC JEANS. SOLID JEANS. These are our standard rates. Rates will be higher for large sizes or extra heavy jeans. U.S.A. CANADA OTHERS. SEVERAL STAINS & PAINT SPOTS THROUGHOUT. These are zipper fly. "F" on the back of the top button. Structurally sound and wearable with no holes, stains or tears. Amazing pair of original late 60's era big E Levi's 501A jeans. Redline stitching, "6" behind the buttons, 5 pocket button fly. No hidden rivets. In overall excellent worn in shape! Labeled 30x36 though they fit a bit smaller due to wear and shrinkage. Destroyed, stained, ripped and repaired to perfection! 1960s or early 70s straight leg wrangler jeans with a mix of hand and machine repairs. Holes in legs and crotch that have all been patched or sewn up. Size 3 8 x 3 0.